Who is in fact the builder of the other Dutch 245-with-m50-transplant: http://forums.turbobricks.com/showthread.php?t=329198. He sold his (again) and wanted it back (again) so he bought mine. All the while I had this 242 which I bought little over 4 years ago. It's a '76 with b20 and 4-speed. I drove it every now and then but I had it parked at my retired father's place and he uses it mostly for himself and to drive the grandchildren around. I used it for a holiday to Romania few years back. It was great on the Transfagarasan, one of the best roads in Europe. It was however horrible on the highway. I have very little love for the b20. 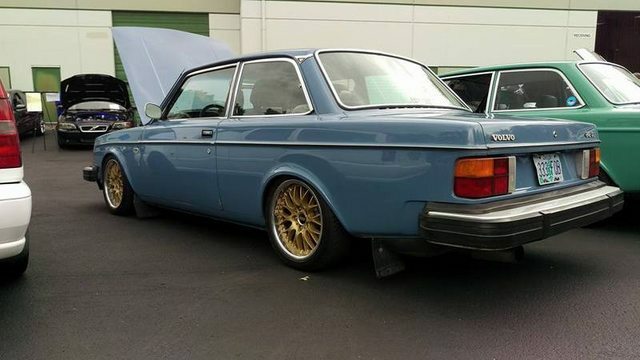 So at first my idea was to build a b230fk with bigger t for it, then I scrapped that. Then I built a b230+16V head for it..... and sold that. The main reason is that I never really got a concept for it (and I need a concept when I build a project car) other than another 242 with 16V engine. So I bought a M60B40 from a 1995 e38 740i. I decided the concept should be an american muscle car, but completely made from european parts. Anything non-metric is banned. The car will have an automatic, comfortable black leather seats (from a Citroen XM), airco. And a 5HP30 5-speed automatic. It's huge. And 109kg. I could prepare the swap without the car so the last months I've spend some time building engine mounts and resealing and checking the engine. This is it so far. Hopefully the car will be drivable by spring 2019. I'll keep updating. Last edited by Arn02; 10-21-2018 at 01:27 PM..
Do you want to sell the B20 M45 bell housing? Really like the 245 too and love how it rides, curious how this will be! Cool project! The M60 looks right at home in there. Made a strutbrace to compensate for the added torque. I will make linke to the firewall later. Shifter will work for sure. Swapped motor and fitted the airco. This will work just not sure yet how. How are you going to control the 5hp30? Hell yeah, this is badass. Awesome. That fit in there surprisingly well! I would think weight-wise the engines are close? Lookward to engine management integration. Will you be updating suspension after the swap? M60s sound so good. Can't wait to see this finished. The engine loom is connected with the automatic. I need to plug this in and it will run. I'd have to do so wiring obviously but not there yet. I think the m60+5hp30 is about 90kg heavier than a b230+m46. That's like having a passenger with you all the time. So it was time to get the engine and transmission in. The 5hp30 required a bit a massaging the tunnel. Nothing too serious though. Room enough to get place the steering rack, or take it out if needed. Motor mounts seem fine. Tape measure to the frame rails. I also scored a 404 dme since the 484 from my donor has ews and is a pain. After the engine was in, it was time to make the transmission mount. Bolted through the hardy and used it as a spacer, and made a template to help center the drive shaft in th center bearing. It sits fine so next are the headers. Last edited by Arn02; 11-13-2018 at 03:19 PM..
Well, this should be stupid fun. Really nice. Like the black under hood / blue body. Yes I'm happy with it as well. I was a bit reluctant because of the boy racer-look, like the under-the-hood equivalent of carbon mirrors, but it turned out just fine. This is rad, M60 sounds amazing and loves to be wrung out to high RPM. Small update time. I have been puzzling and testfitting to get everything in the eniginebay in it's right place and connected. For the sake of it and because this is a budget build I want it all simple and elegant with the least amount of (non-necessary) work and effort. So M60 remote oil filter housing and airfilterbox have been kept. Also the relative location of the ecu's is to be the same: in the engine compartment. I won't bore you with too much text so on with the pics. Because the windowwash reservoir is moved to the driver's side and the headlights will be connected on relays, I was able to delete the whole wiring loom on the passenger's side. The engine itself and the wipermotor will be fed from inside through a new hole in the firewall. Made a bracket for the oil filter housing and steering fluid reservoir. Window washer reservoir is from and old bmw 2002 and is perfect for this. I was lucky because an m54 vanos pressure line was a direct fit from the steering pump to rack. Return also connected so the power steering is sorted. Made a new strut brace from some oval tube I have laying around. The round one didn't clear the intake manifold. The m60 airbox (requires some sheet metal wort in the engine bay to work) and the reservoir from a 245 turbo. Not shown yet are the dryer and expansion can for the airco, and the LPG reducer. But I'm positive I'll manage to get those in too. The ecu's in a 540/740 are in a box inside the engine bay. There is even a temp sensor and small fan inside this box. I'm making my own for the 242. I decided to put them there because I also need to put the LPG injection ecu somewhere, so that can go inside, and the wires are too short to get it inside in a way I like. The airco lines are requiring precious space. very cool project Arno, keep it going! Very nice. What is the plan for the exhaust? 2 times through the hood? If only No probably 2x 2.5" to 1x 3" and then under the rear axle and out. My friends stock 245 didn't get a pass for its APK with the exhaust lobbed off behind the rear wheel (with a turn-down on it), apparently there's some regulation since about two or three years that the exhaust has to be stock length.. 75 car too, you might have to go over/under axle and finish it there, though I'd ditch the bend and muffler that usually sits behind the bumper to exit the exhaust on the left. Looks odd from the rear of the car and there's plenty of space to add a muffler or two in the remaining exhaust length.